With summer in full swing it's safe to say I'm trying to incorporate more color into my wardrobe to accent the brighter days! I hit the jackpot with my latest find: my Zara faux leather jacket in bright yellow. (*Pro tip: this jacket is currently on a massive markdown, so I highly recommend making the purchase sooner than later, before it's gone!) This jacket is so fun to style looks with because of the fun color and detailing. 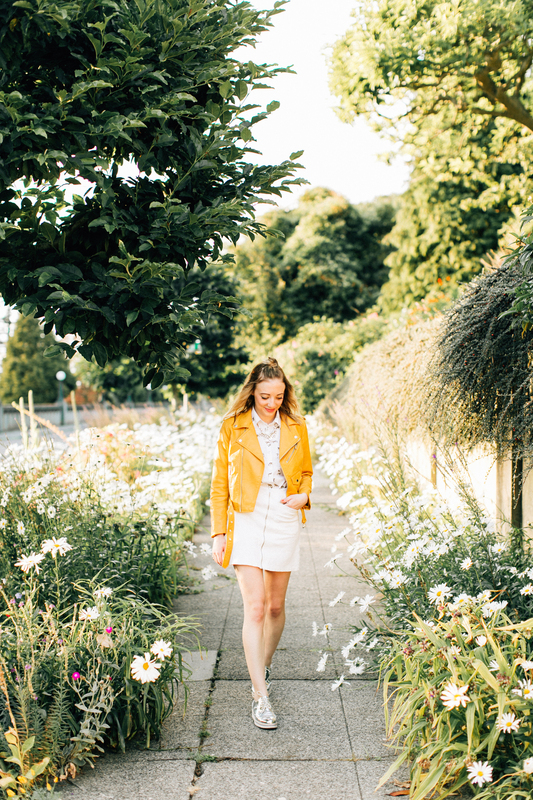 From the front flaps, metallic accents of the zippers and buckles and the belted waist, this jacket fits like a glove and is fairly light, making it the perfect summer outerwear item to throw over an outfit. I'll also be the first to admit I've been going a little print-crazy lately and my other favorite staple to mix and match with is my leopard shirt from Madewell. What better way to wear leopard print than sporting a button-up with ACTUAL leopards!? I love this button-up because it looks great paired with dark wash jeans or tucked into a skirt -- which you'll see I've done here with my Topshop white front zip skirt. I wanted to keep the focus on the front metallic zipper of my skirt to accent my jacket's metallic buckles and zippers so I kept the shirt tucked in. When it came to accessorizing, this is where I had even more fun! To add some bling and additional metallic detailing to my outfit, I am wearing my Forever21 statement necklace. I love a feminine statement piece. I also am wearing my Zara metallic oxfords because they are the perfect staple in the summer that compliment almost any outfit. 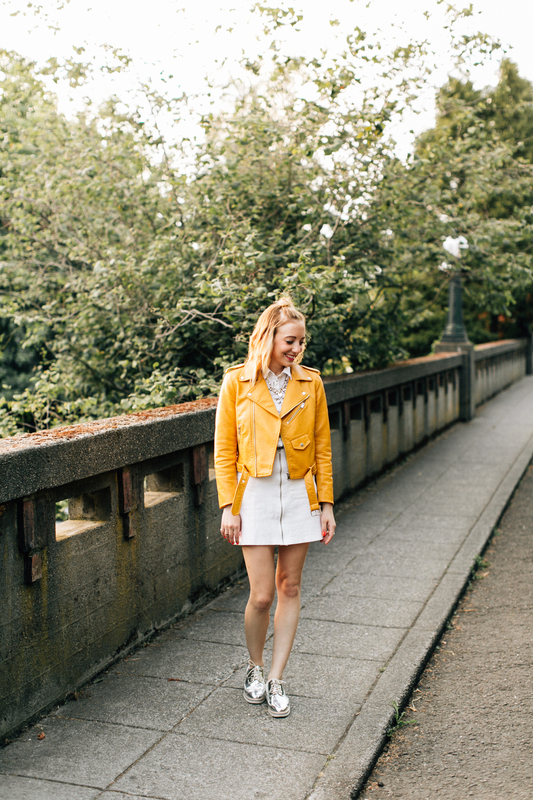 This outfit is work-appropriate, date appropriate and the perfect day outfit because it comes in layers -- which honestly, is crucial during pacific northwest summers. My recommendation for playing up print, color and metallic? Don't be afraid to be bold. Dare to wear all of your favorite statement pieces and see how well they coordinate!